Card table has been getting attention from around the web. Here are some of the things people are saying about it. ...many of us have a smartphone on hand 24/7, [but] few of us have a deck of cards in our pockets as well. Which is why this app that creates a virtual deck and a virtual card table on an iPad is so wonderful. Simply called The Card Table, the app's name reflects its minimal features and options, but don't for a second think that means it's not incredibly useful. If you know you're around friends with iPhones and need a deck of cards for a game night, now you have one free of charge with the gadgets you already own. Plus, you never have to worry about shuffling properly. We're frequently asked about compatibility with Android, and we understand why. Each player needs a device to play The Card Table and not everyone has an iPhone. The unfortunate answer to the Android question is that we do not currently see a way to make The Card Table cross-platform. The reason is that we are using a new feature in iOS 7 called the Multipeer Connectivity framework, which creates and manages connections between devices over Bluetooth or Wifi. It is possible to connect iOS and Android devices together over wifi, and there are a couple of third-party frameworks that handle those connections. However it is entirely impossible to connect an Android device to an iOS device over Bluetooth, due to Apple security restrictions. So for now we are waiting for a way to make cross-platform Bluetooth and Wifi connections possible. We do not think cross-platform Wifi connection support is worth losing Bluetooth and losing the ability to leverage the iOS-only framework that does exactly what we need it to do to make The Card Table work. Here is some reading for you about the Multipeer Connectivity framework and iOS-Android peer-to-peer compatibility. Fox 13 News ran a story Saturday evening about The Card Table. Many thanks to them for taking the time to speak with us and share our work with Utah. We did it! Card Table took home the $2500 grand prize in the 2014 BYU Mobile App Competition. Thanks to everyone who downloaded helped spread the word in February. And congrats to our friends who made Sadie O'Green, Later, Pudgy Penguin, and Scrimp on jobs well-done. 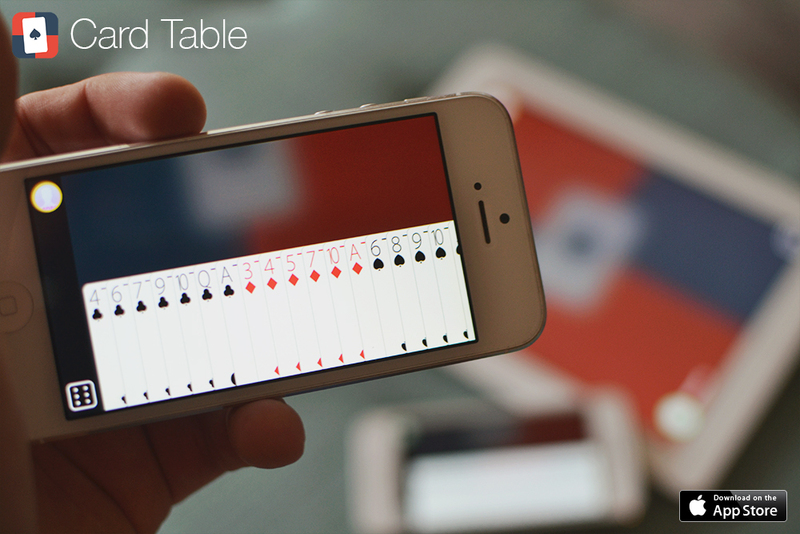 We are now pleased to announce that Card Table v. 1.1 is now available on the App Store. This version represents our complete vision for Card Table. Version 1.0 was in many ways a proof-of-concept for us (and we were in a hurry to make the app available for the competition). We appreciate all of the love we've been given the last few weeks. We've received overwhelmingly positive feedback along with some astute, insightful, constructive criticism. We've already incorporated these suggestions into version 1.1, which should be available on the App Store by the end of this week. You're going to love it. But today is an important day for us, because the judging period for the BYU Mobile App Competition ends tonight at midnight. That means this is your last chance to download, have your friends download, and play Card Table and have those actions count towards our score in the competition. So please please download, play, and share Card Table with your friends and family tonight. It would be a big favor to us, and an easy favor for you to do, because playing your favorite games on Card Table is so much fun! Also, if you are in Provo, come to the app competition Final Event on Friday, February 28 at 3pm in room W408 in the Tanner Building. At the final event the app with the greatest fan support wins an additional $1000 cash prize! But even better, attendees are entered into a door prize drawing to win an iPad Mini! 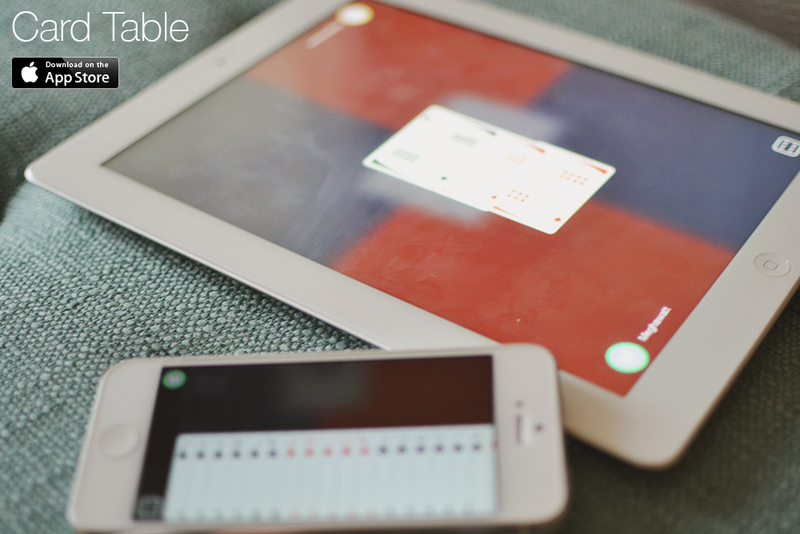 Card Table is in the App Store! This is it! Card Table is here! You can follow this link to download Card Table from the App Store. Please download it on all of your devices (iPad, iPhone, and iPod touch) and play it often, especially the next couple of weeks. We are in the midst of the BYU Mobile App Competition and our usage and download figures count towards our score. Check out this page for instructions on how to play. So what is Card Table? Card Table is an iOS app for both iPad and iPhone/iPod that lets you and up to three of your friends play your favorite card games with a virtual deck of 52 cards. You need an iPad to run the game and an iPhone or iPod touch for each player. The iPad acts like a card table, and is home to the deck of cards. Players keep their cards on their iPhone or iPod, which becomes their virtual hand. Players can send cards between the Card Table (the iPad) and their hands (their iPhones and iPods). In an upcoming blog post we will give a sneak peak at the technology we took advantage of to make Card Table a reality. The short answer is: Bluetooth LE. Right now we want to quickly link to a few articles about the power of an exciting new implementation of Bluetooth LE: Apple iBeacons. An iBeacon can be any iOS device. The technology is built into iOS 7. Simply, an iBeacon is an iOS device emitting an efficient, low energy signal that basically says, "I am an iBeacon! Here I am!" along with a unique ID. Devices running apps that listen for these iBeacons will begin communication or perform some action when they find an iBeacon emitting a signal that interests them. From The Guardian: Is 2014 the year of iBeacons? The version of Card Table you'll be able to download in February embodies our most fundamental vision of the app and its possibilities. It will come with one game mode--a completely open Free Play. You will be able to deal any number of cards (from a deck of 52) to up to four players, and pass cards around however you please. You will be able to select between two card styles, a classic playing card look and a modern restyling. In the future we will offer new features for purchase. For now, we see these in-app purchases falling into one of two categories: gameplay "rules" and card and table skins.